Considerable technical developments over the past half century have enabled widespread application of electronic tags to the study of animals in the wild, including in freshwater environments. We review the constraints associated with freshwater telemetry and biologging and the technical developments relevant to their use. Technical constraints for tracking animals are often influenced by the characteristics of the animals being studied and the environment they inhabit. Collectively, they influence which and how technologies can be used and their relative effectiveness. Although radio telemetry has historically been the most commonly used technology in freshwater, passive integrated transponder (PIT) technology, acoustic telemetry and biologgers are becoming more popular. Most telemetry studies have focused on fish, although an increasing number have focused on other taxa, such as turtles, crustaceans and molluscs. Key technical developments for freshwater systems include: miniaturization of tags for tracking small-size life stages and species, fixed stations and coded tags for tracking large samples of animals over long distances and large temporal scales, inexpensive PIT systems that enable mass tagging to yield population- and community-level relevant sample sizes, incorporation of sensors into electronic tags, validation of tag attachment procedures with a focus on maintaining animal welfare, incorporation of different techniques (for example, genetics, stable isotopes) and peripheral technologies (for example, geographic information systems, hydroacoustics), development of novel analytical techniques, and extensive international collaboration. Innovations are still needed in tag miniaturization, data analysis and visualization, and in tracking animals over larger spatial scales (for example, pelagic areas of lakes) and in challenging environments (for example, large dynamic floodplain systems, under ice). There seems to be a particular need for adapting various global positioning system and satellite tagging approaches to freshwater. Electronic tagging provides a mechanism to collect detailed information from imperilled animals and species that have no direct economic value. Current and future advances will continue to improve our knowledge of the natural history of aquatic animals and ecological processes in freshwater ecosystems while facilitating evidence-based resource management and conservation. Freshwater ecosystems around the globe face many threats and stressors [1–4], which have collectively led to dramatic reductions in freshwater biodiversity for a range of taxa [5, 6]. Human activities are the primary source of these multiple stressors , such that Strayer and Dudgeon  eloquently describe what they call, ‘the collision between humans and biodiversity in freshwater ecosystems.’ Freshwater ecosystems provide vital resources for human beings (including water for drinking and irrigation, food, electricity and transport) and demands for freshwater have risen dramatically over the last century. The 125,000 species of freshwater animals that have been described represent 9.5% of all known animal species on the planet (including one-third of all vertebrate species), even though fresh waters cover just 0.8% of the Earth’s surface [6, 9], emphasizing that freshwater ecosystems are hotspots for biodiversity . Unfortunately, owing to the proximity of human population centres to sources of freshwater and the associated demands on this resource, these systems are also hotspots for endangerment [6, 8]. Given the immense ecosystem services provided by freshwater ecosystems , the importance of the animals that occupy these waters , and the livelihoods and well-being of the human beings that depend upon freshwater ecosystems [12, 13], there is a need to understand the biology of freshwater animals. Basic life history information (including habitat requirements, migratory routes, foraging and reproductive sites, dispersal and home-range characteristics) is fundamental to understanding animals in relation to their environment, and when studied in the context of responses to human activities, provides resource managers and conservationists with practical knowledge to make informed decisions. However, studying macroscopic animals in freshwater ecosystems comes with its own unique set of challenges. Extreme depths, and high turbidity, discharge or current speed, ice cover, habitat complexity, and macrophyte density constrain the ability to view and collect freshwater animals. Additional constraints are imposed by the fact that some animals are small, cryptic or highly mobile. Although certain types of behaviour and physiology can be easily studied in captivity, relying solely on this type of study can be misleading since such studies fail to mimic natural scenarios involving complex interactions among multiple species and large-scale processes. Today’s field biologists have a variety of tools for studying animals in the natural environment, but given the challenges with visual observation in aquatic habitats, electronic tagging technology is regarded as one of the most effective means of studying the behaviour and ecophysiology of animals in their natural environment . A variety of electronic tagging tools have been used in freshwater for the study of vertebrates and some of the larger invertebrates (summarized in [15–18]; See Table 1). Active telemetry tools that remotely transmit information between a transmitter and receiver, including radio and acoustic telemetry, and passive tools, such as passive integrated transponders (PIT tags), have been applied to a variety of freshwater taxa (Figure 1). Archival devices that record information from sensors (such as temperature, pressure, activity) that can be downloaded onto retrieving devices (also known as biologging) are also increasingly common in freshwater systems. These types of sensor have also been used extensively with active telemetry tools to enhance information collected regarding animal locations. FW, freshwater; GPS; global positioning system; VHF, very high frequency. 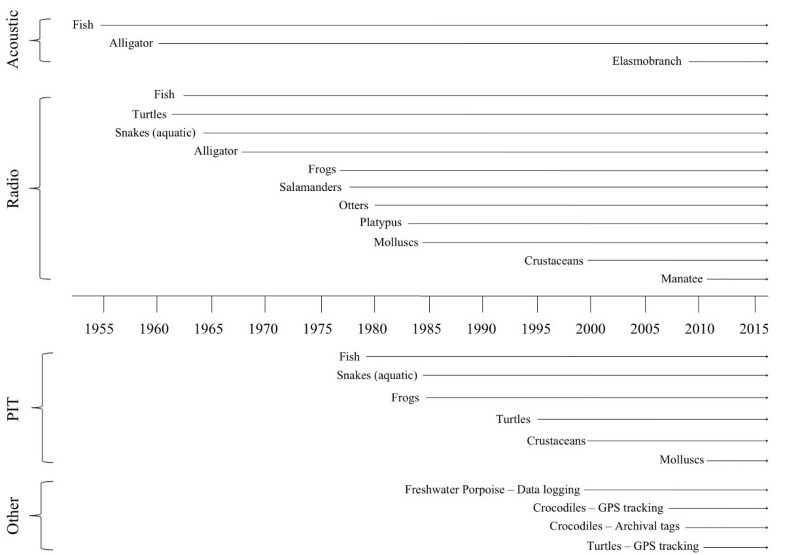 Technology timeline, showing applications for various freshwater species. Early adoption tended to be for larger species of economic importance (that is, salmonids). With miniaturization of tagging technology in the late 1980s, biotelemetry can now be applied to a greater diversity of species. Despite the breadth of current telemetry technology, there are still many challenges associated with using electronic tags to study freshwater species. These range from the problem of attaching devices to animals, to the technical performance of the electronic technology, and methods of analyzing data. By considering historical developments that have led to our contemporary electronic tagging toolbox, it is possible to identify specific constraints and technical gaps that still exist and provide the foundation needed to foster future advances. To that end, the objective of this synthesis is to consider the past, present and future of electronic tagging and tracking techniques and technology. In order to narrow the scope of the review and focus on environments that share similar challenges, we focus on animals found in freshwater systems, including fish, mammals, reptiles, amphibians and invertebrates (mostly molluscs and arthropods) that are sufficiently large to be studied with electronic tags. We exclude all birds, since most associated tracking studies for birds focus on large-scale migrations. We include diadromous fish (but only their freshwater phase) as well as mammals that spend significant time in freshwater (for example, muskrats, manatees). This is not intended to be an exhaustive review. Rather the information presented represents the collective knowledge and perspectives of the authors with experience in using a variety of electronic tagging technologies, in different regions, and on different taxa. The creation and use of new technologies, methods and approaches is a gradual process. As such, many of the key developments are a culmination of innovation and discovery rather than a single discovery (or paper). Table 2 presents a list of key telemetry technologies used to study freshwater animals in the wild, and their associated strengths, weaknesses and typical applications. CART, combined acoustic radio transmitter; GPS, global positioning system; HF, high frequency; PIT, passive integrated transponder; PSAT, Pop-up satellite tag; VHF, very high frequency. The progression of smaller and more efficient electronic components has been a major advance for aquatic telemetry, making it possible to reduce tag size substantially, and tag and track a wider range of species and life stages. Miniaturization has also made it possible to increase the capabilities of transmitters used on larger animals in terms of operating life, reception range and environmental and physiological sensors. Like many technologies, this has been a gradual process, and many of the advances in the 1970s set the stage for future work. Specific details in journal articles were often relegated to a few lines in the methods section, but the overall trend can be inferred from the steady increase in telemetry papers focused on habitat selection and movement patterns in smaller species and juvenile life stages of fish [63, 64], and increasingly smaller nonfish taxa, such as some amphibians (black-bellied salamanders ) and invertebrates (crayfish ). Radio tags as small as 0.25 g, acoustic tags as small as 0.30 g, and PIT tags as small as 10 mg are commercially available at the time of publication. The advent of coded transmitter signals is a technical advance that made a major impact on the study of freshwater animals. Prior to the mid-1980s, most telemetry studies were limited to small numbers of individuals (usually <40) in relatively confined areas. The need for more quantitative data on large aggregates of fish, such as the timing and number of returning adult salmon and their migration through entire watersheds , made it necessary to develop new approaches for dealing with large numbers of wide-ranging individuals. Because of the commercial importance of Pacific salmon returns in north-western North America, funding was often available to support these developments, which subsequently had transferable benefits for studying other species. In addition to increasing the number of frequencies being monitored, transmitters encoded with simple, audibly distinguishable signal patterns (for example, single, double and triple-pulsed transmissions) or varying pulse rates (for example, 60 vs. 90 pulses per minute) were used to increase the number of unique individuals that could be identified. By the late 1980s, more sophisticated signal patterns were adopted, which together with receivers able to distinguish the encoded signal, dramatically increased the number of individuals that could be identified . For acoustic applications, the advent and application of code division multiple access technology enabled multiple animals to be detected simultaneously . Coded tags are now taken for granted, but represented a significant innovation for freshwater systems. Passive telemetry systems (where receivers are deployed at stationary locations to record tagged animals that come within range of an antenna or hydrophone) in freshwater were based on coded transmitter technology. Receivers deployed throughout watersheds, and linked via satellite to relay data back to a central processing facility, were first deployed for Pacific salmon to study their upstream spawning migration . Receivers could be programmed to scan a variety of frequencies and antennas, either sequentially or simultaneously (for example, using digital spectrum processing [68, 69]), sometimes in an intelligent manner such that when fish were present they would prioritize ‘listening’ on a given antenna or frequency . Stationary acoustic receiver systems were first used in marine systems [70, 71] and are now routinely applied in inland waters, especially large rivers, lakes and reservoirs to assess migration patterns . Hydrophones, coding and signal-processing advances mean that freshwater animals can now be tracked in river systems that were too turbulent and noisy for previous acoustic systems [71, 73–75]. Autonomous omnidirectional acoustic receiver-loggers can be deployed in arrays to efficiently record diadromous fishes migrating between freshwater and marine systems, by enabling the same individuals to be employed in both habitats. This is even possible for small fish, thanks to the availability of relatively small transmitters compared with the combined acoustic and radio tags (CARTs) previously available). This technology, when used in combination with archival tags, has enabled researchers to describe detailed behaviour of steelhead trout during the riverine and oceanic migration . Many of the passive acoustic systems can be deployed subsurface and operate autonomously for extended periods (over a year) without requiring additional maintenance and battery changes, which has allowed for continuous tracking of the behaviour of freshwater species [23, 38]. Recent developments include links to communication systems (for example, satellites, cellular networks, underwater acoustic modems) to enable data collection without retrieval of equipment. Large-scale acoustic telemetry arrays have now been installed in the Laurentian Great Lakes and many large river systems around the globe, and are based on international collaborations in transboundary waters focussing on wide-ranging animals. If configured with a minimum of three time-synchronized hydrophones, hyperbolic navigation using time difference in signal arrival can be used to generate highly accurate and precise animal positions [42, 70]. To date, there are only a few published examples using such technology in freshwater, which have focused on questions of spatial distribution and variation in temporal activity [26, 27, 77], but many projects using that approach are now underway, including some that use relatively inexpensive technology to look at simultaneous fine-scale movements of multiple individuals . Passive PIT telemetry arrays (discussed below) have also provided similar benefits. Development in antenna technology robust to dynamic river and stream conditions  has enabled longer-term field deployments. The technical contributions noted above have led to a number of important and unique ecological advances. Unlike many marine and terrestrial ecosystems, rivers are by nature linear. The work of Fausch et al. was instrumental in discussing some of the problems associated with trying to conduct ecological research broadly within the ‘riverscape’. Telemetry applications provide a rare exception; a research method that actually capitalizes on the physical structure of dendritic freshwater ecosystems in capturing movement processes. For this reason, stationary receiver-loggers (often termed automatic listening stations) of radio, acoustic and inductive coupling forms have been deployed along many reaches of rivers to determine rates of movement and survival [20, 22, 75, 79, 80] and along diverging paths to the sea to determine route selection [20, 81]. While the use of acoustic telemetry arrays in marine environments has provided important spatial data for large-bodied marine fauna, there has been an even greater rate of return for investment in telemetry infrastructure in rivers. This is largely a function of the contained and branching nature of rivers, when compared with the unconstrained shape of most marine areas in relation to the relatively limited range of acoustic receivers. Passive integrated transponder telemetry has provided an affordable tool that enables researchers to study smaller individuals or juvenile life stages than is possible with radio and acoustic telemetry using both active and passive tracking. In addition, tags remain viable for long periods (years), owing to the lack of onboard batteries, allowing long-term tracking of individual fitness proxies, such as growth and survival [16, 82–84]. Owing to the much shorter range (less than 2 m perpendicular to the antenna plane) than radio and acoustic transmitters, PIT telemetry has mainly been used in smaller systems. It is especially valuable in assessing fish movement through narrow passageways, such as fish passes  and streams [86, 87], but is increasingly used in wider swim-through channels (30+ m × 0.8 m deep) using an array of tag readers. Passive systems yield high-quality long-term recording of large samples of animals at discrete locations . Mobile PIT detectors (backpack and boat or trawl-mounted models for example ) have been developed as a less obtrusive method for studying the ecology of refuge-seeking or cryptic species of fish, invertebrates (for example crustaceans [90, 91], molluscs) and amphibians . One prominent innovation with PIT telemetry has been the ability to visit bird colonies to estimate predation on small fish (mostly salmonid smolts) by locating PIT tags on land . Further, the cost of PIT tags remains about one hundredth of that of battery-powered radio and acoustic transmitters, facilitating large sample sizes with PIT telemetry. The incorporation of sensors into radio and acoustic transmitters and archival tags has provided novel insight into animal-environment associations and the energetic costs of different behaviours (for example, basking) and stressors (for example, fisheries interactions, fishway use). Some of the earliest sensors incorporated into electronic tags were simple activity or motion sensors that provided the status of a fish (that is, whether it is moving or stationary ). The success of these tags encouraged the development of other sensor types. Physiologically oriented sensors (for example, electrocardiography; electromyography, acceleration) have been used primarily on fish [95, 96]. Electromyography sensors incorporated in radio transmitters were developed in the 1970s to record opercular muscle activity or overall fish locomotor activity [97–99], and are today the most commonly used physiological sensor tool for studying energetics and migration in freshwater fish . Electrocardiography or other cardiac metrics, such as heart rate (see  for review) have been used in radio (for alligators  and for fish ), acoustic (for fish ) and archival (for fish [104, 105]) tags. Of late, acceleration loggers [105, 106] and acoustic acceleration transmitters (SJC, unpublished data) have been used to assess temporal changes in energy expenditure and movement rate and are expected to grow in popularity for application in freshwater, akin to the uptake of this technology in terrestrial and marine applications [107, 108]. Environmental sensors, particularly temperature and pressure (that is, depth ), have been used on a wide range of reptiles (for example, turtles ) and fish  and have been used in radio and acoustic transmitters and archival tags to link location with the environmental parameters measured by the sensors. Other environmental sensors linked to transmitters have also been designed to assess the range of key parameters, such as conductivity  and oxygen , that fish are exposed to during normal activity. Relatively cheap archival temperature tags now available on the market enable collection of long-term thermal information and large sample sizes, provided that the tags can be retrieved (for example, alligators , turtles , salmon ). Early sensor tags were developed by individual researchers, who would build the tags either themselves or in collaboration with engineers [112, 117–119]. However, many of these sensors now represent ‘standard’ options for commercially available tags, and their use is greatly simplified. Collectively, these tools have provided novel insights in animal behaviour, energetics and physiology that would not be possible by simply measuring the location of an animal. In addition to improvements specific to telemetry and logging equipment, advances in other, often unrelated, technologies have dramatically increased the options available to researchers and made them easier to adopt. For example, availability of low-cost GPS, some even integrated with receiving systems, has improved the positional accuracy and usability of the telemetry data collected (a vast improvement over drawing circles on a map ) allowing fine-scale assessment of movement. Uplink technology (for example, satellite, Wi-Fi, cellular, Bluetooth) and nonvolatile data storage has made it faster and easier to recover telemetry data from stationary tracking systems, particularly those in remote or inaccessible areas. Computerized databases have increased the efficiency of data analyses, and links to the internet make the information easier to disseminate and widely available. More so than in marine environments, significant effort has been devoted to the development and validation of various attachment and implantation procedures (including pre- and post-tagging care), particularly for fish (reviewed in [58, 120, 121]) but also for reptiles . If the tags or associated tagging procedures result in altered behaviour, energetics, condition or survival relative to untagged conspecifics, then findings emanating from tagging studies may be biased or incorrect . Most research efforts have focused on identifying the maximum tag burdens for a range of taxa (including turtles, fish and amphibians), testing and optimizing tagging techniques, assessing different tag types, [123, 124], testing anaesthetics (for example, for turtles  and fish ), and identifying species- or taxon-specific challenges . These challenges often relate to the composition, rigidity or permanence of an animal’s outer surface in regard to externally tagging (for example, reptiles [122, 127], an elasmobranch , a slippery fish , crayfish ) or physiological acceptance of foreign bodies following internal tagging [130, 131]. Particularly in freshwater, fouling of external tags (for example, with macrophytes) and associated impacts on drag have led to innovations in internal surgical procedures  that have advanced tagging for marine fish. Indeed, many of the refinements in animal handling associated with the development of tagging procedures for freshwater fish have led to broader improvements in and attention to animal welfare for aquatic animals used in research . Although early studies focused largely on using electronic tags to identify habitat use and movements (that is, descriptive; reviewed in ), electronic tagging is increasingly being combined with other techniques and tools. Such advances have increased the complexity of questions that can be addressed and provide more mechanistic explanations of animal behaviour through hypothesis testing (reviewed in ). This can be accomplished with integrative studies that combine techniques in parallel (for example, a study that has a laboratory and field component), by obtaining nonlethal biological samples from tagged animals (for example, stable isotope analysis , genetic tests , physiological status studies [27, 137]), or by experimentally manipulating tagged animals (for example, hormone manipulations , controlling feeding , cortisol injections ) or their environment (for example, temporary holding studies followed by release ). Some of the earliest of such studies occurred on Pacific salmon in Japan and involved evaluating homing mechanisms  and the endocrinology of migration (reviewed in ). Recently, the first example of combining genomic studies with field telemetry of Pacific salmon identified the factors that are associated with migration failure in freshwater . Integration of fish telemetry with detailed hydrodynamic studies has been used to optimize fish passage facilities through improved understanding of fish cognition and behaviour . The number of such integrative studies appears to be increasing. Following their development for terrestrial applications, many of the analytical techniques now being applied in marine systems were first applied in freshwater . Of particular note is the use of mark-recapture models (and software for fitting models) for estimating detection, survival and state transitions during migration through rivers [146, 147]. These papers adapted Cormack-Jolly-Seber and similar models (developed in the 1960s for survival through time) to salmon migration. More recently, survival analyses have been adapted for telemetry data from fishway assessments . Voluminous amounts of data can be collected using telemetry but the advent of easy-to-use, computerized databases  has made it possible to organize and process data efficiently and present information in a highly useable form. Records of tag detections from many freshwater species have been entered into large databases managed by software such as ACCESS and HYDRA. The development of geographic information system (GIS) methods (for example, ), space-use analyses  and such computer programs as ARCVIEW, ARCINFO, RANGES and R has simplified and opened new possibilities for analyzing movement data in freshwater habitats. For example, fish telemetry data analyzed with home-range software led to important findings related to home-range establishment and shifts [152, 153]. Nevertheless, most space-use analyses have been developed for terrestrial or marine applications and careful assessment of their applicability and bias is needed for the restricted and sometimes near-linear habitats of freshwater systems . Although not unique to this field, there has been a notable increase in the number of freshwater telemetry studies in remote areas around the world, and also in many less economically developed countries. These efforts have contributed significantly to solving basic and applied research questions in regionally important freshwater animals, and have broadened the habitat types and animal taxa covered by such studies. As noted previously, given the threatened status of freshwater ecosystems and their animal inhabitants, there is a great need for studies on fishes that support commercial and subsistence fisheries in less economically developed regions (for example, central Africa , the Mekong basin , the Amazon basin ). While biotelemetry has long been recognized as an important tool for freshwater research in these regions , its adoption has been driven by an apparent increase in available funding for international studies and collaborations, and for studies in developing countries, together with facilitation of such collaborations with the development of email communication and the internet, and greater affordability of equipment. Workshops have also been targeted towards building capacity for doing freshwater telemetry studies in less economically developed countries . The technical advances discussed in this paper have provided a strong foundation for the development of new technologies and technical innovations. Many of these advances will undoubtedly have an impact on the methods used to study aquatic animals and their surroundings. Although several emerging trends are evident in the literature (for example, advances in integrating and summarizing large data sets and the adaption of telemetry tools to novel species and environments), most can only be imagined. Here we provide an overview of what we regard as desirable future technical innovations and research needs related to the study of animals in freshwater systems (not ranked in any particular order). Most of these advances relate to transmitter design, tagging methods, tracking capabilities and tools for analyzing the large amounts of data collected. As in the past, many of the new technologies needed to overcome the constraints identified (Table 1) will probably come from advances in other fields that are then applied to fish and wildlife applications. A major limitation with current telemetry systems is the size and functionality of the transmitters. Larger tags can provide increased reception range, operating life and sensor options, but limit the size of the individual and life stage that can be studied. Battery size is currently a limiting factor that dictates the ultimate size of the transmitter, the number and type of sensors that it can contain, and the duration of its longevity. Developing smaller, more efficient batteries to reduce transmitter size and increase operating life and reception range would help, but only to a limited degree. These technologies need to be combined with either hardware or software solutions that allow for more efficient power usage. Ultimately, more advanced tags will hopefully allow for near-lifetime tracking of large, long-lived animals from juvenile to adult in large freshwater systems (for example, large tropical catfishes). While great strides have been made towards miniaturizing tags, there are limits to how far we can go with current technologies. In short, a technological wall has been reached that might significantly limit the extent to which we can study aquatic species. To that end, we preface this section by noting that in many ways we need a paradigm shift in the type of equipment we use to tag and track freshwater species. A component of this shift will be the development of tags that conserve battery power (to increase their lifespan and power peripheral sensors) until they are either required to collect data, or are transmitting data for collection. While not necessary for all applications, this transition will open up new avenues of research and innovation aimed at lifetime tracking of individual behaviour and environmental interactions. While the development of very small, long-lasting, inexpensive tags with a long range under a variety of environmental conditions remains an obvious but unlikely desire (dare to dream…), here we focus primarily on technical needs. Given the extreme range of environmental conditions (for example, subarctic areas or tropical systems) that are home to freshwater species, adapting receiver technology for these conditions is essential. The production of field-ready (that is, waterproof, shock-proof) receiver housings would greatly expand the application of expensive telemetry equipment. While many sensors have been developed for a wide variety of applications, there are still areas where improvements to sensors or entirely new sensors would benefit the study of freshwater organisms. General improvements to both the reliability and ease of using complex sensors would make them more widely applicable. For example, while geolocation tags that use light or a magnetic field have produced valuable results, there is room to improve the algorithms used to derive their position. Reduced battery size has allowed for the development of PIT tags with simple sensors (for example, temperature). Further development of sensor and data storage PIT tags, as well as systems capable of transferring data from the tags, has great potential for large-scale studies. Work on this is ongoing in non-wildlife fields (), but freshwater researchers should look to incorporate these technologies into their research. While the concept has already been used in marine systems, freshwater animals may represent potentially useful bioprobes that can aid in environmental monitoring. A necessary component is the development of multisensor devices that provide spatial and environmental data that can be tracked over large spatial and temporal scales. At the individual level, mortality tags have been developed that broadcast when an individual stops moving for a set amount of time. As tag sizes have decreased, prey species have increasingly been the focus of telemetry studies. With motion-sensing mortality tags, prey that has been consumed by a predator may still appear to be alive; therefore, development of a tag that senses when an individual has been eaten would provide a more accurate indication of mortality. The combination of real-time, simultaneous, hydroacoustic echo-sounding (horizontal or vertical) with interrogation of individuals with transmitters or transponders is a concept that dates back to Mitson and Storeton-West . Given the numerous technological improvements since the 1970s, this approach should now be explored using state-of-the-art hydroacoustic equipment to simultaneously combine local-scale habitat and animal (especially fish) distribution and abundance to telemetered behaviour and ecophysiology of tagged individuals. The major limitation associated with archival tags is the need to recapture tagged individuals to acquire stored data. A potential solution would be the development of archival tags with rapid download capability, probably downloaded as an individual moves through a remote gate. Since not all fish will pass near enough to such a structure, this design could be further improved through the addition of a ‘chat’ function that allows data to be exchanged between individuals and stored. This technology would be perfectly suited for species that are known to aggregate at some point in their lifecycle but may have low individual recapture rates (for example, adult sturgeon, which aggregate to spawn). Although some large diadromous fish can be tagged with pop-up satellite archival transmitters (PSATs) in freshwater and pop-off transmitters in marine waters (for example, Atlantic sturgeon tagged in Hudson River ), there is a need for PSAT tags that function well in terms of both generating positions and ‘popping-off’ in freshwater. Presently, most pop-off assemblies are based on corrodible links that require a saline environment to degrade the attachment material, thereby limiting their application in freshwaters. Reception range, which should ideally be maximized due to the sizable areas typically associated with in-situ studies, is often marginal or inadequate. To expand the use of these studies to more complex environments, efforts should focus on improving monitoring systems that are capable of tracking animal movements in large, powerful river systems. Solutions will need to include overcoming underwater noise and improved deployment techniques for acoustic telemetry equipment. To combat background noise that interferes with detections (a common problem in urban areas or near infrastructure, such as power plants), unique radiotelemetry coding systems could be developed or site-specific frequencies could be selected. Similarly, novel coding-schemes may help to improve the effectiveness of acoustic telemetry when species are located among macrophytes. Passive integrated transponder (PIT) tags have been used successfully to study a variety of aquatic species under controlled settings, but the reception range (typically less than a metre) is insufficient for many studies in large, unconstrained environments. The development of more robust and powerful PIT systems and antennas that work in larger environments and under a broader range of environmental conditions will extend the application of PIT tags. Possible solutions include the further development of PIT trawls and meshless static PIT ‘gillnets’ that detect tagged fish as they swim through them. In addition, when multiple PIT-tagged individuals pass through a stationary array, one tag may block the signal from another. The development of a method that prevents or circumvents this blockage is essential, to ensure that all individuals are detected. For many telemetry studies, collecting large amounts of data is not a challenge. However, some variables (that is, continuous monitoring of depth or acceleration) are currently limited to archival storage tags. Advances in telemetric transfer and decoding of large or complicated datasets could expand the type of telemetry tags used for collecting continuous or long-term data. Similarly, enhanced telemetric transmission (in terms of rate and volume of data) would improve the transmission of video images (for example, ‘critter cams’) either in real time or using archival tags. While a great deal of work has been directed towards improving tagging techniques (especially in fishes), further refinement of tagging procedures and validation of tagging techniques using the species being tagged (rather than surrogates ) are essential. This is particularly true for invertebrates, especially those that moult (for example, crustaceans). In addition to refining current techniques, there is also a niche for developing a rapid, internal tagging technique that can be used with aquatic vertebrates and large invertebrates (for example, development of injectable tags that are minimally invasive and require no anaesthetic). Two and three-dimensional arrays are one of the most promising new methods for tracking tagged individuals. Unfortunately, high costs and the complicated nature of both the system themselves and the data they produce limit their broad application. A cheaper and more user friendly two- and three-dimensional system would open new possibilities and improve studies of detailed individual movements in areas above and below dams and through fishways or other possible migration barriers. One of the major challenges associated with two- and three-dimensional arrays is the overwhelming amount of data that can be acquired. To encourage the application of these arrays, data filtering and spatial location calculation methods need to be developed that can be easily applied, ideally by the scientist rather than the vendor. While passive telemetry systems have been installed in small lakes and both large and small rivers, there is a need for the development of large-scale communal telemetry systems at the scale of watersheds and entire lakes . This would allow for ecosystem telemetry studies and manipulations of individuals in their entire natural environment. A broad theme for all of the aforementioned future developments is to improve user interfaces and make them more readily accessible to nonexperts. This concept of user-friendliness also holds true for computer programs designed to organize and analyze large and cumbersome databases. Software improvements that allow users to integrate and summarize large databases easily would be a great asset, and built-in functions, such as analysis of home range, would be useful (especially in spatially complex environments). Also, from a statistical perspective, models are needed that estimate spatial movement processes and survival probabilities while accounting for observation errors. State-space models seem to have some promise, but a general model framework and software are lacking. An important part of realizing the seven future needs that we have identified is the fostering of a strong relationship between users of telemetry equipment and those that design and produce it. These relationships have been and will be central to technological advances in freshwater telemetry. Early on, there were relatively few commercial vendors so most researchers either built their own equipment or worked with technical staff within their own agency or institution. Indeed, many of the first commercial suppliers were former researchers themselves, and the spirit of cooperation continued as they developed their product lines and became established. Although the quality of telemetry gear has vastly improved in recent decades, the importance of collaboration between suppliers and users remains paramount. Most equipment purchases are based on predesigned items that may or may not be ideal. Many researchers assume that this is what is available and so make do, and vendors are often reluctant to make changes unless there is a clear upside for sales. Although this is understandable from an economic standpoint, it is not conducive to advancing the technology in a field where funding is often limited. Collaboration between field researchers and product designers and manufacturers is likely to be a key factor in relation to the utility and effectiveness of future advances. Over the years, advances in electronic tags have had a significant impact on the ability to study aquatic animals under a variety of challenging conditions. Here, we reflected on the history of these advances and, in doing so, we were able to characterize the key technical developments that have made electronic tags such a useful tool in research. Most research activities and innovation have arisen from work on fish, but there is certainly an opportunity for greater application of such technology to other taxa and to smaller animals including invertebrates and amphibians. Many constraints make the use of electronic tags challenging, but for most applications there is at least one form of technology that will work. The reality is that technological limitations require researchers to make trade-offs, which necessitates preparation of clear research questions and research priorities during the study design process. Different research questions may require the application of very different technologies. Compared to where the field was 50 years ago, we have come a long way. Innovations continue, as summarized here, but there are still a variety of future needs that, if achieved, could open more doors for studying freshwater animals. Electronic tag practitioners and equipment manufacturers need to work closely if such advances are to be meaningful and rapid. However, not all of those needs are purely technological, as continued work is needed on analytical and statistical procedures to handle the large volumes of data generated. Further, efforts to refine and validate tagging procedures to ensure that the data are representative of untagged conspecifics and that the welfare status of tagged animals is maintained, are still needed. Many meaningful gains in conservation and management will likely be ascribed to electronic tagging innovations in freshwater in the next 10 to 20 years, and we expect novel discoveries relating to fundamental animal and environmental biology. Indeed, with the growing threats facing freshwater ecosystems and their fauna, the need for further technical and technological improvements is urgent if the scientific community is to provide the data needed to inform conservation efforts. SJC is supported by the Canada Research Chairs program and the Natural Sciences and Engineering Research Council of Canada (OTN Canada). We thank Greg Bulté for directing us towards relevant reptilian literature. The findings and conclusions in the paper are those of the authors and do not necessarily represent the views of the National Marine Fisheries Service). Reference to trade names or commercial products does not imply endorsement or recommendation by the National Marine Fisheries Service, NOAA, the USGS or the US Government. This manuscript is contribution number 1745 of the USGS Great Lakes Science Center. All authors helped to identify important historical developments, current constraints and future needs for freshwater biotelemetry in their specific areas of expertise. In addition, JDM helped to synthesize these contributions and SJC wrote the initial draft of the manuscript. All authors were also involved in subsequent revisions of the manuscript. All authors read and approved the final manuscript.